﻿Free billiards ability tests and pool workout. See where you stack up (external web-link) worldwide. Discover what needs work, and improve your game. 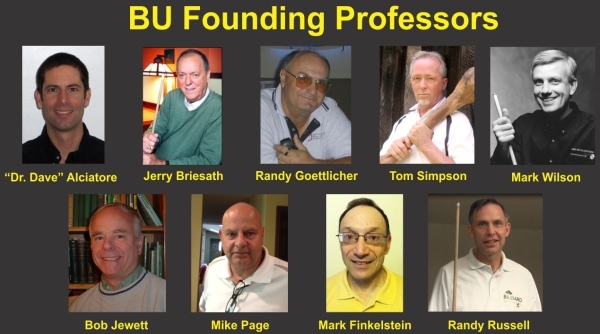 BU Mission/Vision: to provide online assessment tools, a rating system, and learning resources to help pool players strive for and achieve excellence, and to officially acknowledge excellence through the awarding of diplomas. Additional online videos cover the details and provide exam demonstrations. The examination process fully and impartially assesses your current rating and level of ability relative to others. The exam drills identify your areas of weakness. The exam drills can provide structure and purpose to your practice sessions by offering a complete and well-designed pool workout. You can use the exam and drill scores to monitor and assess your improvement over time. You can set a concrete goal for improvement by working toward a diploma. When you earn a diploma, you can frame and display it with pride (e.g., in your office or game room) to show off your enthusiasm and excellence. Instructional Videos: The 3-DVD instructional video series (external web-link) provide instruction on techniques and aiming systems that can help raise your game to the next level. The BU DVDs also provide advice, guidance, and hot tips concerning how to practice and learn strategies to achieve the highest BU score and diploma possible.